I was taking pictures for the FilterCam contest and this one didn’t make it in to be entered for the contest, so I Photoshopped & Photoscaped it to death. LOL A little something different from all the hearts & pink & flowers that will be around today. 🙂 If you want to see my entries for the contest, feel free to go to to my Flickr page. So Valentine’s Day is tomorrow. Whew. LOL I had a lot of different blog posts in my head for what I’d do for the 14th. I’d find a valentine and surprise them every day for a week with something cute, and then blog it. I’d set up a friend with someone that they may like, and then blog it. I’d check out all the “winners” over at AvMatch, and then blog it. But life and SLife happens, and none of these came to pass. And maybe that’s for the best. 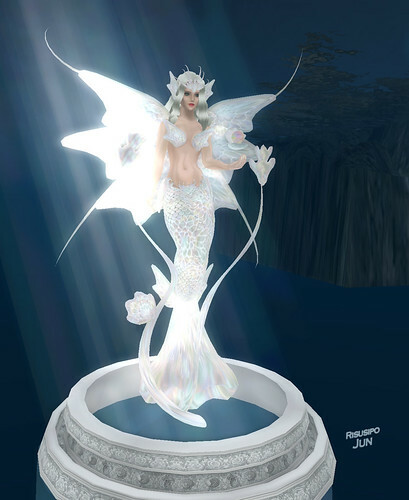 I have been surprised with a couple of wonderful gifts from friends in SL, and that is more than I ever expected. In my physical world, I do not expect anything tomorrow. I learned about 6 years ago that expecting anything was almost a sure sign I’d be disappointed, so I stopped. And although I do agree that nice things & feelings should be expressed all year round, the simple fact is that often, they are not. Sometimes you need that one day to remind your guy “Hey, I’m a GIRL. I’m a GIRL who likes ROMANTIC THINGS once in a while!” But anyway, that’s a story for a different, and much more private, journal. So in SL tomorrow I will settle in at home, perhaps work on my yard, or just enjoy the home I’ve created for myself. It’s funny, but I almost never just sit in the one really decorated room of the house and just enjoy it. I’m usually stuffed away in my “dressing room” sitting on a posestand, surrounded by boxes. And well, that just shouldn’t be. Like my pic? I took that with FilterCam. I went to FilterCam class earlier today. I adore Codie, I would pay anything for an ounce of her brain. But I did discover today that if you use the Restrained Life Viewer thingy [I enabled it in my preferences on Emerald], then if you make a Windlight preset and name it after one of the FilterCam presets, when you go to that preset, it changes your Windlight setting too! So cool! And bless her, Codie probably told me that one night when she was telling me all about the features and how to change filters, but teaching me anything is not very easy. Anyway, the class was awesome, and I caught this photo. No fancy FilterCamming, just the default. Don’t forget, there’s a contest going on using FilterCam too! Last night I headed over to the aQuatria Gallery, which is own by my friend Raven Haalan. Raven was out there when I went, so he gave me the tour. I’ve never been a huge art girl. I can appreciate it and think it’s pretty, but I won’t say that I ever really GET it or look for deeper meanings. But, I’m trying to expand my horizons. The gallery is really awesome and there’s a LOT of great art out on display. But my favorites were all in the “Mer” level, which is underwater. I was so so so taken with this mermaid sculpture by Risusipo Jun. It is just so pretty! A closer shot of the face. She BLINKS! You guys really need to go out there and check things out. You may even recognize some of the artists’ names! Codie gave me a sneak preview of the new FilterCam that will be coming out soon. I immediately went to a vignette filter. The only Photoshop work I did on this pic was cropping. Total love.